WASHINGTON -- Federal Communications Commission Chairman Tom Wheeler revealed a big win for net neutrality advocates on Wednesday, asking for strong authority to enforce open Internet protections. 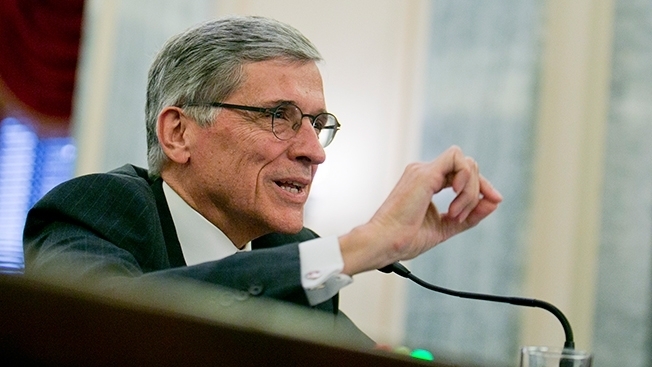 In a Wired op-ed, Wheeler said he is proposing the FCC use its authority under Title II of the Communications Act to protect consumer broadband Internet. This move will allow the FCC to stop Internet service providers from charging content providers like Netflix more money for reliable Internet access. "Using this authority, I am submitting to my colleagues the strongest open Internet protections ever proposed by the FCC," he wrote. Wheeler said that his "enforceable, bright-line rules will ban paid prioritization, and the blocking and throttling of lawful content and services." The FCC's plan includes equal rules for mobile and fixed networks and will be voted on by agency commissioners later this month. Wheeler is also proposing that the agency, for the first time, should have strong authority over points of interconnection, the gateway between an Internet service provider and the rest of the Internet. The FCC will investigate complaints about unfair interconnection activities on a case-by-case basis. Until recently, a Title II plan was a pipe dream for net neutrality advocates. But President Barack Obama came out in support of Title II reclassification and bright-line rules in November, and Wheeler, who had reportedly been considering alternative approaches, appears to now be on board. A senior FCC official addressed the effect of the president's announcement on Wheeler's decision-making on a call with reporters Wednesday. "It was actually the aftermath of the president's announcement that proved to be so important," the official said, citing reactions from financial analysts and ISPs such as Sprint. "That reaction demonstrated convincingly that Title II could be tailored for the 21st century without harming investment." Advocates applauded Wheeler's proposal. "I've gotten messages from people in the start-up community where they're pinching themselves to make sure it's real, they're really pumped," said Marvin Ammori, a lawyer who advises major tech companies and supports net neutrality. However, the announcement signals a major blow to telecom and cable companies who have been fighting Title II. Doug Brake, telecommunications policy analyst at the Information Technology and Innovation Foundation, said in a statement that the decision is an "unjustified, overblown response to what has in actuality been a by-and-large hypothetical concern." On Capitol Hill, Republicans are still waging a last-ditch legislative effort to strip the FCC of the authority to enforce strong Internet protections, but that campaign has little support among Democrats. Net neutrality advocates will also be watching to see whether the FCC proposal will provide any additional loopholes for telecommunications and cable companies, although Wheeler's announcement seems to indicate that they will get the bright-line rules they have been asking for. "We look forward to seeing the exact details of the FCC's rules," David Segal, executive director of Demand Progress, an Internet activism group, said in a statement. "All indications point to this announcement as reassuring for the future of the Internet, free speech and American innovation." Wheeler added, "Broadband network operators have an understandable motivation to manage their network to maximize their business interests. But their actions may not always be optimal for network users." This post has been updated with details from a Wednesday call with the FCC and comment from Marvin Ammori and Doug Brake.